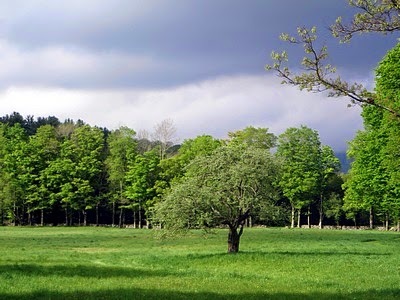 A weekend in the Beaverkill Valley. 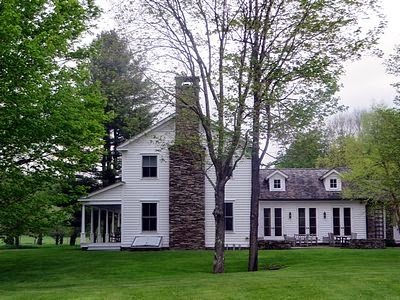 Thanks to the kindness of a neighbor, we were invited to spend Memorial Day weekend in this splendid house located in the Beaverkill Valley, in New York's Catskill region. We had visited the same house in November of 2012, as memorialized in this post. 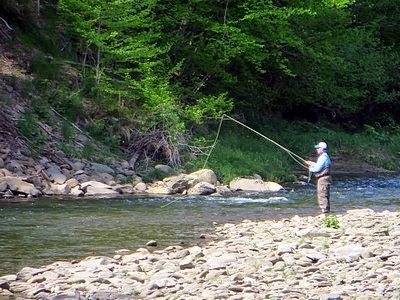 The Beaverkill (or Beaver Klll: "kill"is the Dutch word for stream; the Dutch were the first Europeans to settle in the region and found many beaver dams along the watercourse) is renowned as a trout stream. The photo above was taken just across the road from the grounds of the house in which we were staying. 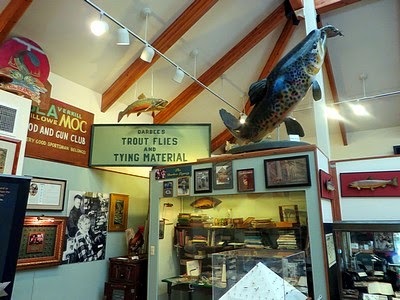 We visited the Catskill Fly Fishing Museum in nearby Livingston Manor, New York. 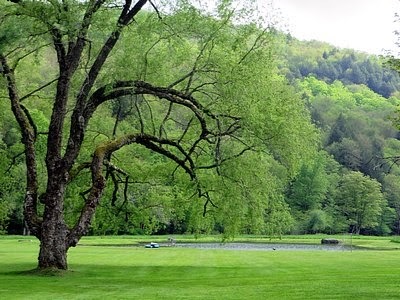 This is a view from behind the house in which we were staying, looking toward a pond and the hillside beyond. 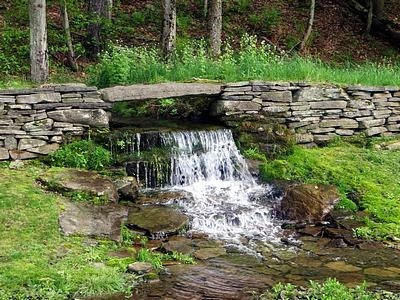 An artificial waterfall conveys a small stream through a breach in a stone fence, from where it flows to the pond, and beyond that to the Beaverkill. On our previous visit I made a short video while walking along this stream from above the waterfall to near the edge of the pond. 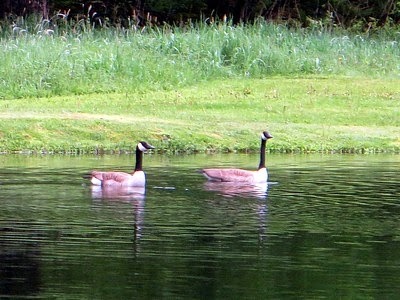 Two Canada geese were paddling on the pond. I saw several different species of birds over the weekend, and will publish more photos in a subsequent post, "Birds of the Beaverkill." 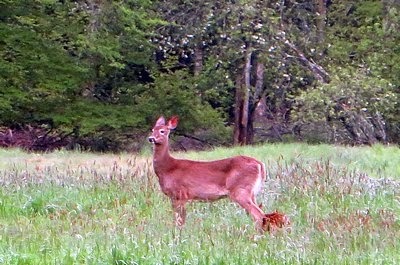 On Saturday morning I saw this doe and fawn on the meadow near the pond. That evening I had a closer encounter with what may have been the same pair which, along with photos of other animals, I'll show in a later post, "A Beaverkill Bestiary." 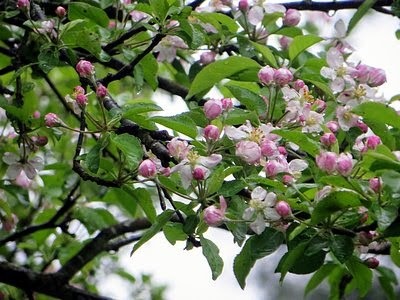 Apple blossoms in the small orchard on the opposite side of the house. 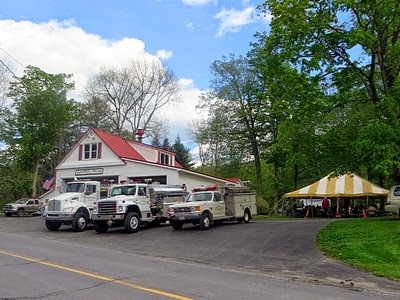 Our Sunday dinner was a delicious chicken barbecue prepared by the Beaverkill Valley Fire Department. 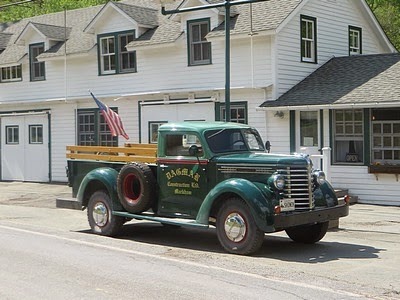 Parked in front of the Co-Op Store across from the firehouse was this antique pickup truck belonging to a Connecticut construction company. 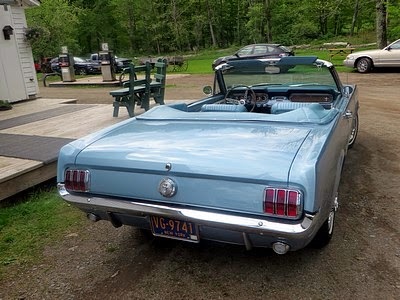 Parked beside the store was this beautifully maintained early model Mustang. Another view of the house grounds, with storm clouds and mist gathering.